VERONA URBAN TREKKING Visit Verona from a different perspective. Walk up to San Pietro castle with its breath-taking belvedere and discover the northern historic walls. Enjoy the Planet, main theme of Expo 2015. We leave from the central Bra square with the Arena in a easterly direction towards the Roman Forum, St. Anastasia basilica and Pietra bridge. We look at St. Pietro’s hill in front of us while river Adige flows shaping an “s”. Then we climb the stairs that take us on top of the hill where we can admire a wonderful panorama from the belvedere. The city lies at our feet: brown roofs, towers and belfries. Here was the very first settlement of the city of Verona in the I millennium B.C. Walking through staircases and dirt paths we reach the walls that in the past surrounded the entire city passing St. Felice castle and Rondella della Grotta. The views on Valpantena valley are extraordinary. Unusual places far away from the city crowds. We immerse ourselves in Expo 2015 main themes: Feed the Planet, Energy for Life. Verona is in the World Heritage List Unesco for its walls and we can admire the different phases: Cangrande della Scala walls reinforced by the Venetians and adapted to modern needs by the Habsburgs in the nineteenth century. We enjoy new views of the city and along the way we stop in the most scenic places to take photos. Then we descend through Scala Santa road and along river Adige till Stella road and back to Bra square. - The tour is suitable for all ages. Anyway the itinerary presents stairs, climbs and slopes. - This tour has a 2 passenger minimum requirement for operation and is subject to cancellation if this minimum is not met. Top Travel Team is an indipendent travel agency and tour operator established in 1999 in Verona. The very close-knit team deals with outgoing, incoming and ticket office with competence and courtesy. The company philosophy proposes slow travels to deeply know the local reality of the visited countries. “Let’s bike! Verona bike tours” project promotes sustainable mobility together with cultural, artistic and wine and food peculiarities of the territory. Top Travel Team is born in 1999 and since 2005 deals with the technical organization of bike travels for FIAB (Federazione Italiana Amici della Bicicletta). 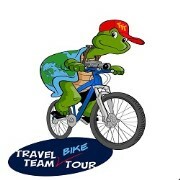 Since 2007 Top Travel Team offers packages including bike tours. Two or three nights’ stay to discover the best known and the less visited masterpieces of beautiful and romantic Verona. Since 2013 it has bought its own bicycles and has developed “Let’s bike! Verona bike tours” project to promote half-day itineraries of Verona and its surroundings (Valpolicella, Valpantena) by bike with a local tour leader, with the purpose of joining cultural proposals and the opportunity to enjoy the tasting of typical products as local wines, cheese and extra virgin olive oil. A special attention to the territory, to its peculiarities and riches to make known and pass on with the slow and relaxed rhythm of a bike. Mostly flat and not very extensive Verona reserves pleasant surprises for those who want to venture out around typical neighborhood and adjacent valleys. Top Travel Team has created its own “Travel Team Slow Tour” travels with the desire of creating tours for those who want to visit a country and learn about the local reality.These tours around the world allow you to discover the local reality, to observe in a deeper and more human way the surroundings. These trips can get you in touch with people, and this kind of meeting can transform the simple curiosity of a tourist in a concrete contribution by helping the local economy.